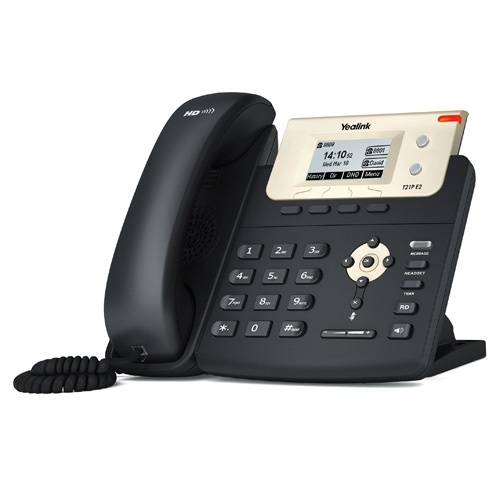 Yealink’s SIP-T21P E2 takes entry-level IP business phones to a level never achieved before. Making full-use of high-quality materials, plus an extra-large 132x64-pixel graphical LCD with backlight showing a clear 5-line data display, it offers a smoother user experience, much more visual information at a glance, plus HD Voice characteristics. Dual 10/100 Mbps network ports with integrated PoE are ideal for extended network use. The T21P E2 supports two VoIP account, simple, flexible and secure installation options, plus support for IPv6, Open VPN and a redundancy server. It also operates with SRTP/ HTTPS/ TLS, 802.1x.As a very cost-effective and powerful IP solution, the T21P E2 maximizing productivity in both small and large office environments. HD Audio – Yealink HD Voice refers to the combination of software and hardware design as well as the implementation of wideband technology to maximizes the acoustic performance. Coupled with advanced acoustic clarity technology such as full duplex, echo cancellation, adaptive jitter buffer etc. Provide clearer, more lifelike voice communications. Enhanced Call Management – The SIP-T21P E2 supports vast productivity-enhancing feature such as XML Browser, call park, call pickup, BLF, call forward, call transfer, 3-way conference. Which make it the natural and obvious efficiency tool for today’s busy small and large offices environment. Efficient Installation and Provisioning - Integrated IEEE 802.3af Power-over-Ethernet allows easy deployment with centralized powering and backup.The SIP-T21P support the FTP, TFTP, HTTP, and HTTPS protocols for file provisioning and are configured by default to use Trivial File Transfer Protocol (TFTP), supports AES encrypted XML configuration file. Highly Secure Transport and Interoperability - The Communicator uses SIP over Transport Layer Security (TLS/SSL) to provide service providers the latest technology for enhanced network security. The range is certified compatible with 3CX, Asterisk and Broadsoft Broadworks, ensuring excellent compatibility with leading soft switch suppliers. Find more specifications for the Yealink T21P E2 IP Phone here. Request a Quote from one of our Solution Experts.